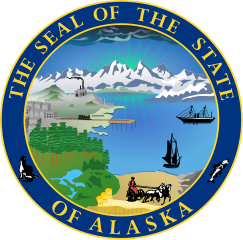 The U.S. purchased Alaska from Russia in 1867 for just two cents an acre, a purchase that proved to be a good investment when oil and gold were discovered there. Alaska is the biggest U.S. state. Home to thousands of species of animals including: Polar Bears, Moose, Brown Bear, Black Bear, Mountain Goat and Caribou. It has more forest than any other state. Few humans live there though and it is considered one of the last truly wild places in the U.S.
Alaska borders Canada to the east and the Bering Sea and Arctic Ocean to the west and north. At one point, it lies just 55 miles from Russia. More American Indians live in Alaska than any other state. The name Alaska comes from the word Alyeska, an Aleut Indian word that means great land. 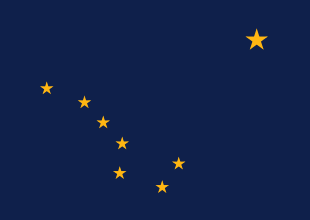 Alaska is one of the leading producers of oil and natural gas in the U.S. Millions of gallons of petroleum products are produced here every year. Conservationists worry about the long-term environmental consequences if this industry. Alaska has short summers and long, cold winters. For several months, the sun does not shine at all. During the summer months, the sun doesn’t set. During these months, people stay up late. Children play outdoors at midnight. And garden vegetables become huge because of the extra sunlight they get. The Tongass National Forest is the largest U.S. national forest. Humpback whales migrate to Alaskan waters during the summer months in search of food. These whales eat hundreds of fish in one bite. Alaska is one of the leading U.S. producers of seafood. Question: Do people in Alaska live in igloos? Answer: The Aleut people sometimes still live in igloos, but most people live in modern homes. Watch a short video about Alaska.